Join members of the Surrey Board of Trade and local business leaders for a discussion with the President of the Treasury Board and Minister of Digital Government, Honourable Joyce Murray. Minister Murray will discuss Budget 2019, her work to lead regulatory reform across the federal government, and supports for small businesses. This is your chance to ask questions and give feedback. Following a highly successful 25-year career building an international reforestation company and 4 years in the provincial cabinet of the B.C. 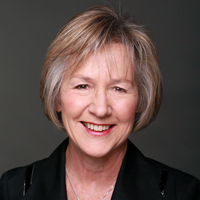 government, the Honourable Joyce Murray was appointed President of the Treasury Board and Minister of Digital Government on March 18, 2019. Minister Murray served as the Parliamentary Secretary to the President of the Treasury Board following the 2015 general election. In this position, she championed and helped lead the development of the Centre for Greening Government. Joyce Murray has always been a thought-leader, driving progressive new policies in government. Whether advocating for strong, smart environmental measures or being an early advocate of the legalization and regulation of cannabis, Joyce's ability to envision and deliver on bold new ideas comes from her depth of experience in politics and business. Registration 11:45 a.m.; Program: 12:00-1:00 p.m.